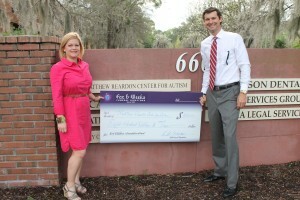 Fox & Weeks Funeral Directors was honored to present a York Children’s Foundation grant in the amount of $800 to the Matthew Reardon Center for Autism in April. The Matthew Reardon Center for Autism in Savannah is dedicated to the care and education of children with Autism Spectrum Disorders. Through partnerships with existing medical, educational, and community services we provide special programs that enhance the quality of life for these children. Through the MRCA day school, Advance Academy and Advocacy and Outreach programs and community partnerships, the MRCA is able to provide programs and services designed to assist these children and their families and to enhance the quality of life for all.